Brief description: Potato beetles are a gardener’s nightmare. Not only are they voracious eaters of plants, but they are highly fertile and unusually resistant to insecticides. They devour not just potato crops but also tomato, eggplant and pepper plants. Potato beetles are thought to originate from Colorado and Mexico, but today, they are well established across the United States, Europe and Asia. By the mid 1800s, the species became the most destructive pest of potato crops in the U.S. Widespread use of insecticides for agricultural crops were useful in controlling the beetle until the 1950s, when it became resistant to DDT. Other pesticides have gone to battle against the potato beetle since then, but the beetle has developed a resistance to every single one. Scientists estimate that their legendary resistance stems from their coevolution with their host plants, the Solanaceae family, which have high concentrations of toxins. The beetles overwinter in the soil as adults, typically in woody areas next to the fields where they spent the previous summer. They then walk to the field, or, if the target crop has been rotated, fly up to several kilometers to the desired host habitat, where they colonize, feed, and lay eggs. Females can lay up to 800 eggs at a time, depositing them in batches on the underside of host plant leaves. Once hatched, larva begin to feed on plant foliage. They devour the plant for several weeks or up to two months, then burrow into the soil and enter a dormant pupate state. A mature adult emerges a few weeks later, depending on conditions, and they feed on foliage as well. Vast family reunions are possible for this fertile species. Three or more generations can spring up in a single growing season. The potato beetle’s adaptability to unstable environmental conditions make it a difficult pest to control. Adult potato beetles are small, yellow and black striped bugs. Immature beetles are hard-shelled, bright red insects with two rows of ridges across their humped backs, and lines of black dots along each side of their bodies. Potato beetle eggs are bright orange and attached to the underside of leaves. 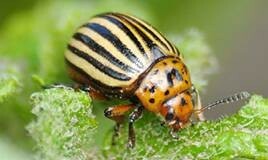 Home gardeners can control potato beetle infestations by hand picking adults and egg clusters from the plants early on in the season. Look under plant leaves for orange eggs, and crush any that you find. Drop adults and larvae in a bucket of soapy water. Stick with this approach for several weeks, because overwintered adults colonize host plants over a one-month time period. In addition, remove dead plants from the vegetable bed each season and till the bed so that these beetles have fewer places to reside. Certain planting techniques, such as rotating crops, adjusting the time of year that you plant a crop, and using mulch, can all help to suppress potato beetle populations. Synthetic insecticides should only be used in home gardens when other methods fail, and when there is at least one beetle per plant. Insecticides should be rotated so that the same active ingredient is not used repeatedly. It’s important to contact a local lawn care professional before beginning a chemical treatment program for your garden. Resistance to insecticides varies dramatically by region, and so a chemical that stops the beetles in one location might be completely useless in another garden across town.